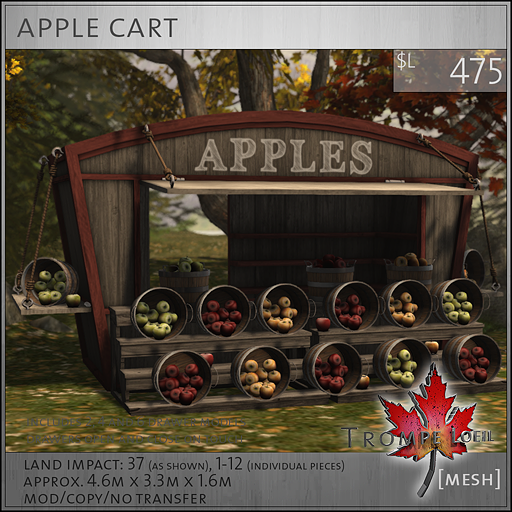 Liaison Collaborative‘s theme for The Garden this month is “The Lodge” – on your way through the woods, stop by and grab enough fresh crisp apples for all, with Trompe Loeil’s new Apple Cart! This picture-perfect prop includes the full set as shown, plus all the individual elements so you can create your own unique display. The cart is able to be entered through the door in the back, and the trim and body are separately tintable so you can explore your own color options – or leave it perfectly natural. The hand-drawn sign at the top includes 4 messages like “FRESH” and “HAND-PICKED”, plus a blank so you can use your own signage if you wish. Please note, this is a prop item only and does not distribute apples. Not only great for your autumn outdoor decor, the cart and shelving can be used for instant sales stand setups for events! Stop by and check out the Apple Cart in person all this month at The Liaison Collaborative!